Say you're building an SVG icon system. You're building a SVG sprite full of symbols by hand, or using a build tool like IcoMoon or grunt-svgstore to create it for you. What do you do with that sprite.svg? One option is to include it right at the top of the document and then <use> away. That works, but it doesn't make very good use of caching. If the site does HTML caching, every single page will have this big chunk of identical SVG in it, which is a bit bloaty. Not to mention the HTML parser will need to read through all of that in the document each page load before moving on to the content. Probably better to take advantage of browser caching, like we do all other assets. We can do that by making our <use> link to an external source. But some browsers have trouble with that. Namely any version of IE and some older WebKit stuff. SVG for Everybody, that we recommended here, mostly works well. But, there are some browsers it doesn't catch with the UserAgent sniff it does. An alternative approach is just to ajax for the sprite (all the time) and inject it onto the page. That means you can browser cache that SVG, and it works everywhere that inline SVG works. Assuming you have a complete SVG document you're ajaxing for (sprite.svg), it's actually slightly tricky. You have to ensure that the SVG is in the proper namespace before you append it to the page (thanks Amelia). Luckily we can exploit the HTML parser that normally is in charge of this. We do this by appending the SVG into a <div> then appending that to the page. If you're using jQuery, the callback data it gives you is already formatted into an SVG document, so you need to force it back into a string before appending it to the div and ultimately the page. Remember that you use with just the identifier when you go this way, not the external source. Also remember that SVG for Everybody helps you with transforming the markup into <img src="...png"> in non-supporting browsers, so if that's important to you, you'd be on your own there. 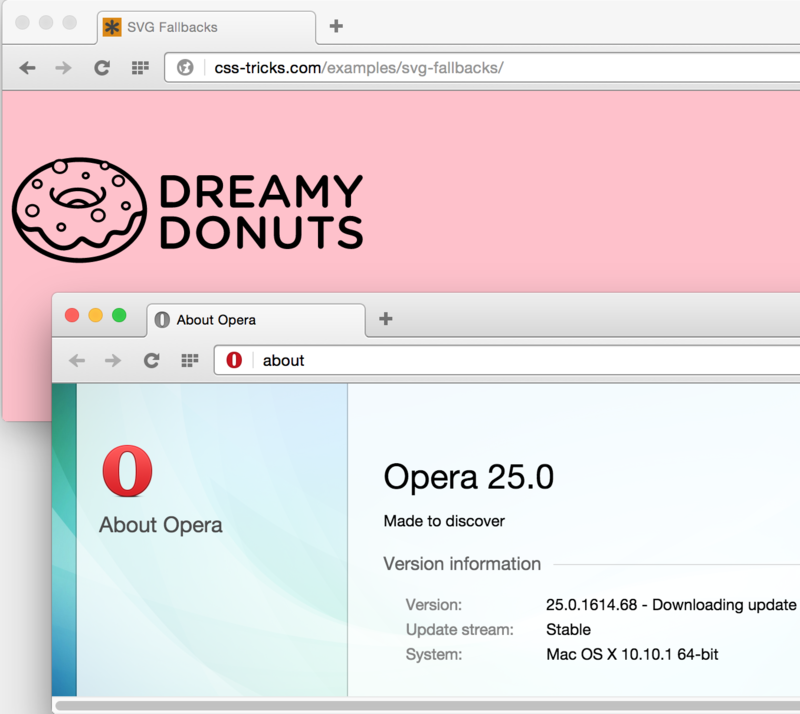 Doesn’t work at all in Opera. Really? It seemes like it does. That looks like it does an ajax request for every single SVG. The idea of a SVG sprite is that it’s a single request. Just something to consider. Yep! I wrote this mainly for use with large SVG’s. Or rather loading CSS-able SVG’s like normal images are loaded. Hence loading them synchronously. Just a tad confused. So you’re saying that using Ajax that the browser is able to cache sprite.svg because the browser treats it as a file yes? Also, you’re of course relying on JS to work. If it fails or disabled obviously this wouldn’t work, but I guess that’s fine if you’re only including enhancements like icons. I’ve been using something similar to load svg combined by gulp-svgstore. The only difference is that I insert content before the script tag. Thanks for the shout-out about the innerHTML trick, but you don’t need it here. XMLHttpRequest provides you with a complete XML document; you can just grab the SVG node and append it directly. The only trick is that for Firefox and IE you need to explicitly tell them that the response will be a document, not plain text/binary data. I would think the image/svg+xml MIME type would be enough, but apparently not. Thanks, Amelia. Could you help me sort out the best way to fetch and load multiple svg sprite files with AJAX? I’m surprised to see this works using an asynchronous request. What happens if <use> is parsed before the SVG is added to the page? can make it just with html 5 ? Well, Its tricky but useful! You get caching & clean markup this way IMO. That looks neat, but does that mean that every single SVG is separate? The larger idea here is single-request. I used this technique to load few separate files, but it shouldn’t matter really. You can load a sprite and then use it like you want. Just did a quick test – seems to work fine in all browsers (FF, Chrome, Safari, Opera, IE 9 – 11). I just stumbled over a nasty quirk with this technique: wherever they’re placed, Chrome (40) sees used symbols (e.g., <use xlink:href="#symbol-id" />) as descendants of the original <svg> tag, including that tag’s position in the DOM, which eliminates the possibility of re-styling the same SVG symbol with different fills depending on the context the use tag appears in. Works in Firefox, and I haven’t tried it in other browsers, but Chrome doesn’t consider the symbol to actually exist within the <use> tag so the selector .pink-logo .logo-part is effectively unmatched. CSS2 selectors can be applied to the original (i.e., referenced) elements because they are part of the formal document structure. CSS2 selectors cannot be applied to the (conceptually) cloned DOM tree because its contents are not part of the formal document structure.